My Mid-Life Motherhood: JT SplatMaster! The Christmas season will be upon us in a matter of hours with the dawning of Black Friday. If you are in the market for something fun and adventurous for a tween or teen, then check out the JT SplatMaster! The JT SplatMaster is an outdoor sporting goods product that shoots color-filled biodegradable ammo resulting in an obvious Splat! The water soluble and stain resistant ammo is easy to clean (washes away with the rain!) and does not stain clothes or other objects. Recently, Bud had the opportunity to have a couple of pals over for an afternoon of paintball courtesy of JT SplatMaster! Getting ready for a bit of fun! They had a great time testing the shotguns and setting up a target range in our backyard. With no assembly required, they enthusiastically dove right into an afternoon of outdoor activity. They soon discovered that getting hit with the JT SplatMaster ammo was much less painful than the typical paintball guns. Bud started out with lots of padding and protection, which he quickly shed after realizing the JT SplatMaster had a softer impact. At one point, an ammo ball bounced right off of our curious cat, without incident! (No animals were harmed in the writing of this post.) Despite the lower intensity, I would still recommend wearing the safety goggles, when firing upon each other. Bud's own glasses gave him the protection he needed for the level of activity needed for target practice. The guys noticed that the ammo would leave yellow blast marks on hard surfaces, so they hung up the target on the playground and proceeded to fire. By the time they were done, the tell tale Splats polka dotted the swing set. With rain in the forecast, I certainly appreciated the clean and easy aspect to what could have been a messy activity! Bud with his paintball pals! The JT Splatmaster provided a fun, safe outdoor activity for a bunch of boys during an afternoon off from school. I imagine that it will do the same for many others this holiday season! 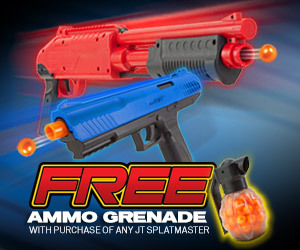 For a limited time, and while supplies last, get a free ammo grenade with the purchase of a JT SplatMaster z100 Pistol or z200 Shotgun at JTSplatMaster.com. In addition, the website features safety training and game play missions, providing further opportunity for fun and creativity. The product line is also available at Walmart. Disclaimer: I received 2 Bundle Packs from JT SplatMaster to review for this blog post. The opinions are all mine, Bud's or his friend's. Yup! We didn't have to clean up at all!